If Jordan Cahan and David Caspe proved anything with the premiere of their new Showtime series “Black Monday” on Sunday, they proved that they know how to catch an audience’s attention. The pilot opens with a sequence which drags the viewer through an astonishing range of emotions in less than two minutes. The series, which is a historical comedy about the titular stock market crash of 1987, opens on a defeated-looking businessman sitting on a curb, sobbing violently in what appears to be New York. In the background, emo punk rockers spray-paint anti-establishment graffiti on a column. The image — a grown man weeping desperately while others move callously about him — is distressing. Almost immediately, however, the viewer’s impression of a desperate situation is replaced by an image of opulence and excess. A Lamborghini limousine passes, blocking the view of the distraught businessman and shifting the tone. Upbeat, swaggering pop music enters and lifts the viewer’s downtrodden spirits. The relief does not last long, however. In an extreme moment of black comedy, the limousine is crushed by the falling body of a suicidal businessman shortly after its driver parks it and exits. The action is violent and abrupt, and the music stops suddenly. The sequence is crafted masterfully; it sets perfectly the tone of the series, embodying the drastic fall from success to failure which characterizes a market crash. Additionally, the narrow margin by which the driver of the limousine avoids being crushed along with his vehicle seems to be foreshadowing something, though Cahan and Caspe may have simply included this for dramatic and comedic effect. Regardless of whether the driver’s narrow survival foreshadows the plot of the show or not, the details of the scene certainly put the viewer on alert — before cutting to the credit sequence, the camera zooms in on the jumper’s watch, a gold Rolex, and on an emerald pin on his tie. When the show returns from the credits and cuts back in time, the creators make a point of showing these accessories over and over again. Gold watches are everywhere, and similar tie pins appear throughout. This sets up a puzzle for the viewer, and also symbolizes the universality of the market crash — anyone could be the jumper, because no one on Wall Street is safe from a crash. The opening sequence sets up the narrative style of the show well. Cahan and Caspe continuously take their characters from incredible highs to incredible lows, dragging the viewer along with them. The best example of this storytelling style is the arc of Andrew Rannells’s (“Bob’s Burgers”) character Blair Pfaff. Pfaff begins his day as a nervous job seeker interviewing with Morgan Stanley. He runs into his interviewer and nervously begins rattling off rehearsed answers to questions he has not been asked. Soon, however, he is delighted to find that the interviewer is desperate to hire him. Pfaff, now with three excellent job offers in his pocket, walks ecstatically across the trading floor and bumps into another central character, Maurice Monroe, played by Don Cheadle (“Iron Man 2”). Monroe, the boss at a powerful trading firm, leverages his power to blacklist Pfaff, getting all of his offers rescinded. Immediately, Pfaff is plunged into the depths of despair. In terms of comedy, “Black Monday” is dense with gems. 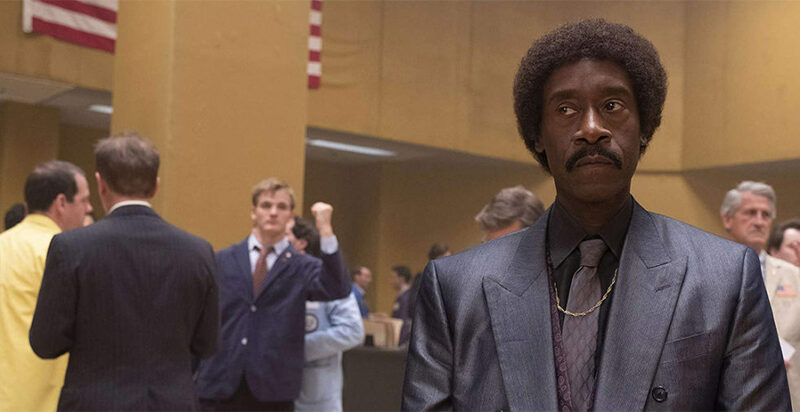 Cheadle’s character is a fast-talking joke goldmine, spitting out hilarious line after hilarious line. Cheadle’s performance is the centerpiece of the show, but the entire cast turns in a great effort. The delivery of jokes is consistent and excellent, the actors complementing the writing perfectly. Everything about the pilot, from the narrative, to the subject matter, to the joke writing and delivery sets the series up for excellence. The first episode of “Black Monday” may be one of the best pieces of television of all time, and the series promises to be among the best on the small screen for years to come.